Find an Offshore, Near Shore or In-Shore trip from Oregon Inlet Fishing Center. You'll notice that just about every major "harbor" along the inlets of the Outer Banks has a fleet of charter boats just waiting to launch. Charter Fishing is one of the biggest draws for vacationing anglers, due mainly to the Outer Banks' proximity to the Gulf Stream. In some areas, like Cape Point on Hatteras Island, the Gulf Stream is a just a 15 mile boat ride away, and provides some of the best big-catch fishing north of Florida. Launching points for charter boats include the marinas in Wanchese on Roanoke Island, the Oregon Inlet Fishing Center adjacent to Oregon Inlet, and Hatteras Inlet, which features a number of landings and marinas for charter businesses to dock. When reserving a charter trip, you'll want to be sure and book well in advance, particularly during the peak visitation months of June, July and August. Even with a seemingly limitless supply of individually owned charter boat businesses to choose from, reservations book up fast. Each charter boat can generally accommodate a party of 6 people, and offer half-day or full-day trips to the Gulf Stream. Smaller parties can be combined together, and individual anglers may want to call a week or so in advance to see if they can be "added on" to a pre-existing fishing trip, generally at a lower cost. You'll also need to plan to be up early - most charters leave the docks between 4:00 a.m. and 6:00 a.m. to ensure as much fishing as possible during peak fishing and feeding hours. It is standard practice to always tip the first mate. Like servers or bartenders, first mates are generally paid a minimum amount and earn their living off of tips. Call beforehand to see what options are available for taking your catch home - many charters will clean and pack your fish for you at the end of the trip, making it easy to grill up the day's catch. Some companies can even ship your fish if you're in the Outer Banks for a quick day or weekend trip. Bring Dramamine. A Gulf Stream trip can be roller-coaster bumpy, especially during the first navigation through the inlets, and a little Dramamine before your trip goes a long way. Many captains recommend taking one the night before, and one about an hour before departure for the most effective results. Also be sure and bring plenty of sunscreen. You might not notice it while you're fishing, but the sun off the water is much more powerful than on land, making it all the more easy to sunburn. If you're new to charter fishing, an experienced captain and first mate can steer you towards the optimal types of fishing for the season, the weather, and for your taste, but generally you can target "meat" or "sport" fish, depending on your end goal of returning home with a week's worth of dinners, or a lifetime's worth of stories. Hatteras Island is known as the Blue Marlin Capital of the World and a number of annual tournaments pay homage to this moniker. A number of record-breaking blue marlins have been reeled in over the past 100 years, and many anglers embark on an Outer Banks charter fishing trip because of the lure of the blue marlins. White marlins, though much more rare, can also be found off the coast, and like their blue counterpart, are caught locally at record-breaking sizes. While there is never a guarantee that you'll find or reel in a blue or white marlin, the challenge in both finding and landing the overwhelmingly strong, fighting fish draws thousands of anglers to the Outer Banks year after year. Fishermen who want to make sure they don't return home empty-handed may want to target the dozens of species of tasty large fish that frequent the Gulf Stream. Mahi Mahi / Dolphin: One of the most beautiful fish in the Gulf Stream, the dolphin is am iridescentturquoise and lime green fish whose color slowly fades after its reeled out of the water. Common when the weather is warm, these fish can range from 10 - 50 lbs., and are usually found feeding along floating lines of sea grass or seaweed. Tuna: Yellowfin tuna are available off the Outer Banks all year long, but as the waters warm up and the winds wind down in mid to late spring, tuna fishing really heats up, with plenty of chances to land tons of Yellowfin, ranging from 15-75 pounds. Amberjack: Also known as Wreck Donkeys, or Reef Donkeys, Amberjack can be found scuttling around wrecks or structures lodged in the Gulf Stream, such as the Diamond Shoals Light Tower located 15 miles offshore. For anglers who want a challenge, an Amberjack can put up a good fight, and has been known to break many lines in the process. King Mackerel can also be caught sporadically throughout the year, but fishing for these good-sized species, (usually between 20-40 lbs.) is at its best in the fall. A very tasty catch, King Mackerel are popular with fall fishermen who want to bring home dinner. Wahoo is a prize fish for experienced anglers, as its quick speed and razor sharp teeth make this fish a struggle to reel in. Often difficult to find and even harder to catch, (but superbly tasty), the Wahoo usually has top billing as the "meat" fish that most Outer Banks Gulf Stream anglers want to catch. 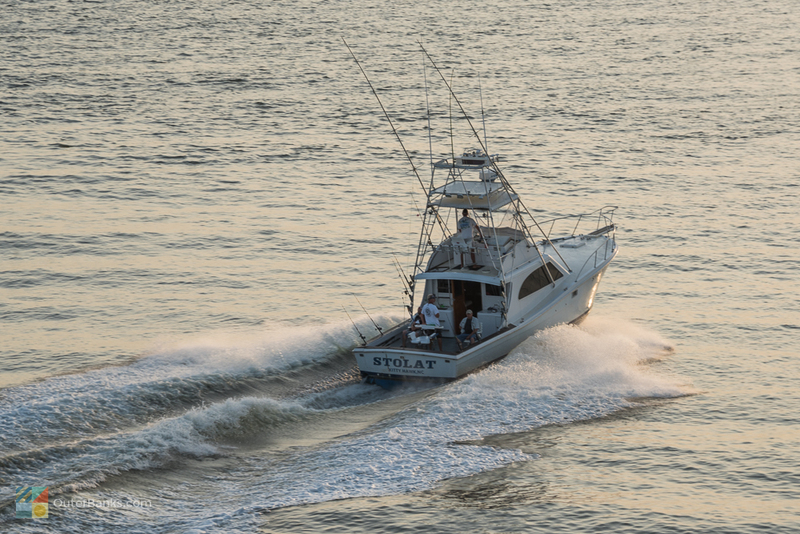 A number of Inshore Charter Fishing businesses have popped up along the Outer Banks in recent years, attracting fishermen who love the thrill of reeling from a boat but may not want to incur the expenses and time that a full-day offshore charter fishing trip can entail. Inshore Fishing is a mixed bag, in that fishermen can expect to reel in both inshore and occasional offshore species, such as cobia, bluefish, tuna, speckled trout, mackerel, and more. An experienced captain will guide the boat to good "fishing holes" on both the soundside and oceanside off the beach, and let the anglers cast away. Another bonus to inshore trips is the variety of excursions fishermen can try. Some inshore fishing trips off of Hatteras Inlet even make day trip excursions to Portsmouth Island, offer dolphin tours, or clamming adventures just a mile or two off the beach. The sheer number of activities, from shelling on a deserted sandbar to trolling for bluefish, make inshore charter fishing a good choice for a family groups with a wide range of interests. Since these first adventurous tourists, little has changed on the fishing front, as the same amazing fishing prospects that drew visitors as far back as the 1920s and 30s remain today. Whether you're casting off the beach, dropping a line from any of the Outer Banks' many fishing piers, or booking a charter boat for an off-shore or in-shore fishing excursion, you'll see why the absolutely amazing fishing is one of the Outer Banks' worst kept secrets. A coastal recreational fishing license is required to fish in the Outer Banks. Exceptions include customers on most charter boats, and children under the age of 16. The coastal license allows you to fish in coastal and joint fishing waters, but not inland or fresh waters. To fish in all NC waters, ask for a Unified Fishing License. For more information on fishing licenses, we recommend this page. For full regulations, we recommend visiting a local bait and tackle shop, pier, or visit the Division of Marine Fisheries website. The easiest way to experience Outer Banks fishing is right off the beach, by simply casting a line right off the shore and seeing what hits. Because of convenience - virtually any stretch of beach will do - this is easily the most popular type of fishing on the Outer Banks, and it's not unusual, particularly in the off-season fall and spring seasons, to see lines of pole holders in between the beach blankets. Little equipment is needed for beach fishing, but you'll want to be sure you have a surfing rod available for long casting and to hold up in the ocean waves. Surf fishing can be a tricky venture as any passing current might give the line a tug and send you reeling. Look for quick rapid movements as a telltale sign that some sea critter is actually on the line. As for bait, there's plenty available at your local tackle shops, and the staff should be able to point you in the right direction. Depending on what you're casting for, you can choose from squid, small mullet and other bait fish, shrimp, or even blood worms. No recommendations were influenced by manufacturers. We did, however, heavily consider customer reviews at retail websites when deciding which products to feature. We like these products, but we took care to make sure other customers agree. Some of the product links include affiliate codes. If a purchase is made, OuterBanks.com is paid a commission for the referral. See our full surf fishing gear guide including rods, reels, line, rigs, carts, waders and more. Rods can be purchased separately, or as a rod and reel combo. Though the length can vary by beach and surf conditions, local anglers traditionally recommend using an 8′ to 16′ light to medium surf type rod, which can adapt to most conditions and most species. Keep in mind that the rod you choose has a lot to do with your physical size – some rods are heavy, and can tire out an angler quickly after multiple casts. Your line will literally make or break your ability to reel in a catch. Look for 20-25 test line for the best results in all conditions, and go for Nylon Monofilament, Fluorocarbon, or Braided Line varieties in terms of materials. Monofilament nylon is a great choice for new anglers, as it is fairly cheap, knots well, and has an inherent stretch, which is a great attribute for surf fishermen who are developing their skills. Like all gear designed for surf fishing, when it comes to rigs and rig set-ups, there are a lot of options, which generally depend on the fish you are targeting, the season, and other conditions and factors that change depending on where along the North Carolina coastline you land. 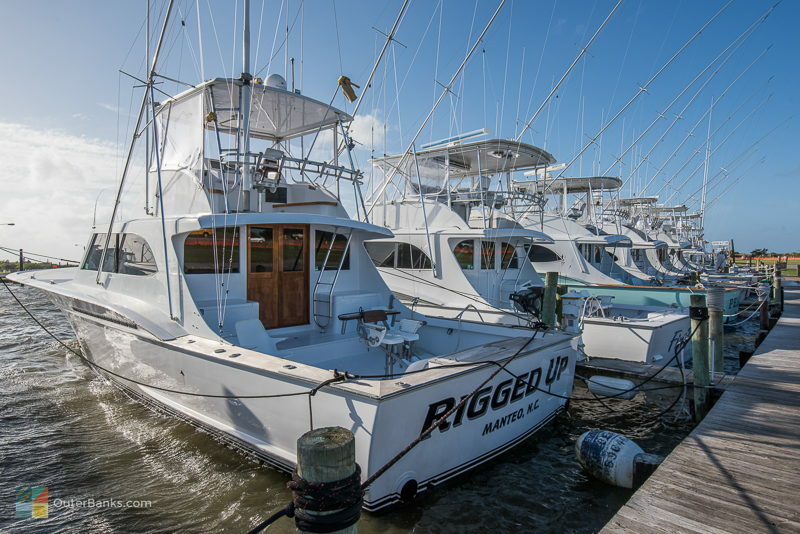 In fact, there is likely a unique and distinct type of rig available for every species of fish, and every type of body of saltwater. The Fish-Finder Rig: The fish finder rig utilizes a pyramid sinker with snap / ball-bearing swivel, and a leader that connects with the hook. This set-up provides as little resistance as possible as your fish is attracted to the bait. You can make the leader as long as you’d like, but on average, 24” inches is a good baseline. The Fireball Rig: The fireball rig utilizes a pyramid sinker connected to foam balls, which keeps the bait slightly off the ocean bottom, The bright colors makes the rig a solid choice when the waters are rough and cloudy, and the rig also works great with live bait. This rig can be set up manually, but can also be purchased already set-up, which is likely the best option for beginners. The High-Low Rig: The high-low rig uses two hooks, which increases an angler’s chances of attracting their target fish. It works well with large predatory fish and natural bait, and can be manually created, or purchased as a complete rig at most bait and tackle stores. Sand spike and other varieties of rod holders will hold your rod in place when you need a break, or just want to enjoy a little downtime relaxing on the beach. This piece of equipment comes in a variety of different materials – such as PVC or aluminum – as well as different lengths, and different price ranges. Rod holders that are made of PVC or ABS plastic are traditionally the least expensive, but if you’re in rough ocean conditions and do a lot of surf fishing, upgrading to a more durable metal rod holder may be your best rouet. A pyramid weight is often the preferred weight for surf fishermen, as it can stand up to currents and hold at the bottom. A roughly 2 oz. to 4 oz. pyramid weight should hold strong in most ocean conditions, when used in conjunction with a surf rod. If it’s a rough day, or you are fishing on a beach with large breakers close to the shore, up the weight a bit to hold strong in the surf. A cart will make a surf fisherman’s life infinitely easier when heading to and from the beach. Built to be pulled across the sand with ease, and large enough to hold all the essential equipment and then some, a beach cart is a great way to pack and tote along all the equipment you’ll need for a full day on the sand. Look for carts that can hold a lot of weight – you may be bringing back plenty of big catches, after all – as well as carts that have larger than normal, sturdy wheels. Larger wheels will essentially transform a standard cart into a 4WD mode of transportation that can easily haul your supplies across soft sand. If you want a longer cast, and you prefer to fish in colder or cooler weather, waders will be your best friend. Waders are effectively worn like overalls, protecting the lower 3/4th of your body from water inundation when you wade out to the surf to cast. Don’t skimp on quality when it comes to waders! Inexpensive varieties can leak, which can turn a great fishing day into a bad one fairly quickly. One of the hardest decisions for surf fishermen is what type of bait, or artificial lure, to use for the best results. Many local tackle shops can direct new anglers in the right direction when it comes to what’s biting, and what bait or lures to use, but here’s a closer look at some of the most popular varieties for fishing along coastal North Carolina. Shrimp – Virtually all saltwater species are attracted to shrimp, which is why it’s found in just about every bait and tackle store up and down the North Carolina coastline. Fresh shrimp is generally preferred over frozen if you can find it, and it’s recommended that you remove the head, cut the shrimp into 3-4 bite-sized pieces if desired, and hook the shrimp through the dorsal back so that it stays securely on the hook. Sand Fleas – Sand fleas are a great (and effective) on-the-spot option when surf fishermen are out of bait, or out of money. In the summer months, sand fleas can often be obtained by digging through the sand close to the ocean wash. Able to attract a wide array of species, sand fleas can also be purchased at bait and tackle stores when they aren’t plentiful along the shoreline. Mullet – Cut mullet is another catch-all bait that can attract a wide array of species. Discard the tail, and cut into small chunks for the best results. Small bait mullet can also be caught for free in area sounds, saltwater canals, marshes, and other calm salty waters with a bucket or a cast net. Menhaden – Menhaden is a cut-bait fish that is popular with bluefish, sea trout, and striped bass – some of the most prevalent species along the North Carolina coastline. Most bait shops will have menhaden available, which can be easily cut and hooked. Squid – Squid is a frequent option at North Carolina bait shops, as it works well with saltwater species of all varieties, and of all sizes. Use whole smaller squids for targeting the big fish, or cut up squid into smaller piece. Clams and Oysters – Though tricky to hook, clams and oysters can attract a wide array of species. Just be sure and stock up – it’s easy for this bait to slide off a hook in rougher ocean conditions. Bloodworms or ragworms – Bloodworms are also available in most all North Carolina bait and tackle stores, as they work well in all conditions, for all types of fish. (They’re also nicely inexpensive!) Best of all, bloodworms can be used for surf fishing, as well as targeting inland streams, canals, and sound waters throughout the coastline. When it comes to lures, there are plenty of options, and what an angler uses is all dependent on where they are headed, and what they are targeting. Bait and tackle store will provide the best recommendations for lures to use for specific species, weather conditions, and seasons, but there are a few popular varieties to try that can work in most any coastal fishing environment. Here are some of the most popular types of lures for saltwater fishing. Gold Spoon – Known as one of the most common lures there is, the spoon is available in all types of colors and sizes, but it’s the gold variety that tends to provide the most flash, and attract the most fish – especially in cloudy waters. Berkley Gulp Alive Shrimp – If you don’t have fresh or frozen shrimp handy, artificial shrimp can certainly work in a pinch and yield great results. Try the Berkley Gulp Alive Shrimp, which most resemble their live counterparts to a wide array of saltwater species. Bucktail Jigs – Bucktail jigs are also varied when it comes to colors and flairs, and the White Bucktail features a steady and sturdy “tail” that easily attracts fish from the end of the hook. Topwater Lure – Topwater lures are another popular option for anglers that can vary from store to store. Red and white varieties are especially popular due to their visibility, and a 4.5” - 5” lure will catch most all saltwater species along the North Carolina coastline. Soft Plastic Flukes – The good thing about a soft plastic fluke is that it can be used just about anywhere – in the ocean, in the sound, or even inland. Completely versatile, flukes come in a wide range of colors and sizers, but bright green or white varieties will work well when the ocean conditions aren’t terribly clear. In addition to all of the above essentials, there are some other tools you’ll need to bring along to ensure you have everything you need for a full day (or night) of surf fishing along the North Carolina coastline. Available at bait and tackle stores, sporting goods stores, and even traditional beach shops or grocery stores, look for these items that will make it easier to spend long hours on the beach. If you find yourself stranded on the beach without any bait left, a quick fix is to find a lumpy pile of sand right in the ocean wash and start digging. Small mole crabs, affectionately known as "sand fleas" or "sand diggers" seasonally gather and nest in the low tide line right where the waves are coming ashore, and a larger sand flea (about 2 inches) can work remarkably well as surf fishing bait. The great thing about beach fishing is that you can walk outside your Outer Banks vacation rental home with a pole and a little tackle, and get to work. However, some anglers like to venture past their beach backyards and explore to find the best spots. With all that gear and tackle on board, many anglers find the best way to go beach fishing is via a little beach driving trip. In the central Outer Banks towns of Kill Devil Hills, Nags Head and Kitty Hawk, driving on the beach is permitted in the off-season, although permits may be required in some areas. On Hatteras Island beaches, anglers can drive 4WD vehicles on the beach year-round, although some of the more popular fishing beaches are closed seasonally in the summer months. Also, in order to drive on the beach, you will need a beach driving permit, which is distributed by the National Park Service (NPS) in several locations along Hatteras Island, like near Oregon Inlet, and at the Cape Hatteras Lighthouse Park Service Station. To receive a permit, you'll need to watch a 10 minute video on beach driving and pay a weekly or annual fee. Once you have your permit, there are a number of beach access ramps, marked with brown NPS signs, all along Hatteras Island from Rodanthe to Hatteras Inlet. Before driving up the ramp, be sure and slack your tires down to around 20psi. (There are plenty of gas stations with free air to fill your tires back up once you're off the beach.) You may also want to bring a shovel and boards along just in case you get stuck. While the best beach spots to explore can certainly vary based on what's biting and where, there are a few fishing beaches that remain popular with anglers all year long. Cape Point: Arguably the best fishing spot on the 'banks, Cape Point is the exact location where Hatteras Island jets out into the ocean before making a western turn towards the mainland. Because of its location, it literally runs with the East Coast's two major currents: The Labrador Current and The Gulf Stream. The treacherous Diamond Shoals lurk offshore, creating sweeping sandbars off the beach that change daily, if not hourly. All of these factors combine to make Cape Point one of the best surf fishing locations on the East Coast. If you go, be prepared to have company. Cape Point attracts fishermen from all over the world, and during the most popular fishing times (particularly September and October), Cape Point can be elbow-to-elbow with anglers. Not that this should deter you - just be sure and be mindful of your fishing neighbors when casting, or if you want more privacy, head south a hundred yards or so to South Beach, also known as "The Hook," where the fishing is comparatively good. Also bear in mind that Cape Point is sometimes closed in the summer months, so check with the NPS first to be sure it is open to fishermen. Pick an Inlet: Another sure spot is any of the inlets that intermittently break up the barrier islands of the Outer Banks. North of Hatteras Island lies Oregon Inlet, below the Bonner Bridge, and north of Rodanthe you'll find the new "Irene's Inlet," which is a small inlet formed after Hurricane Irene in 2011. Further south lies Hatteras Inlet, the large watery gap between Hatteras and Ocracoke Islands, and Ocracoke Inlet, which separates Ocracoke from Portsmouth Island. Because of the deep channels these inlets create, fishing is almost always good. Again, these inlets are seasonally closed, so it's best to check with NPS to be sure accessing them by foot or vehicle is permitted. In addition to a beach driving permit, (if you choose to go beach fishing with a 4wd vehicle), you'll also need a North Carolina fishing license. Fishing licenses can be purchased online before your vacation from the North Carolina Wildlife Resources Commission's website, or at almost any tackle shop on the Outer Banks while you're here. For fishermen who want to get a little further off the beach for better access to the local fishing stomping grounds, the Outer Banks has a number of fishing piers that are seasonally open to anglers. No matter what area you're staying in, a fishing pier is within easy walking or driving distance, and can offer exceptional fishing at a relatively low cost. Best of all, because fishing piers carry their own "license," a fishing license is not required to fish off of an Outer Banks fishing pier. 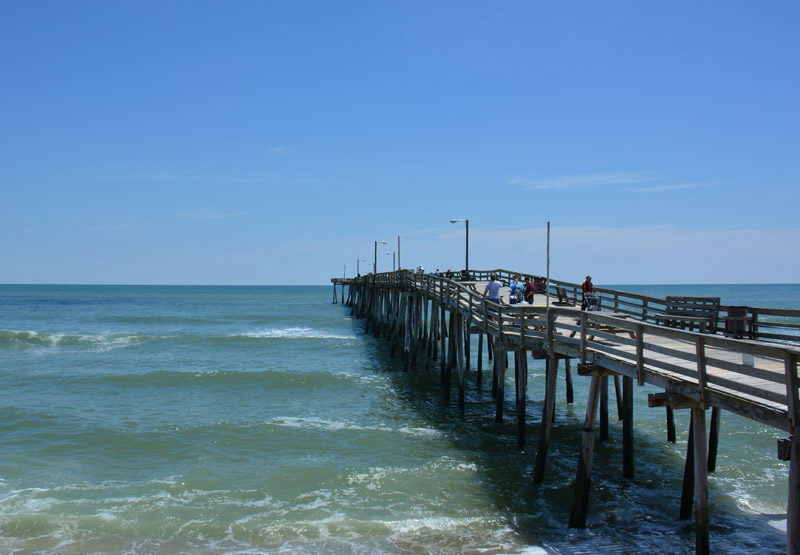 The Avalon Fishing Pier is one of the older Outer Banks fishing piers, having been built in 1950. 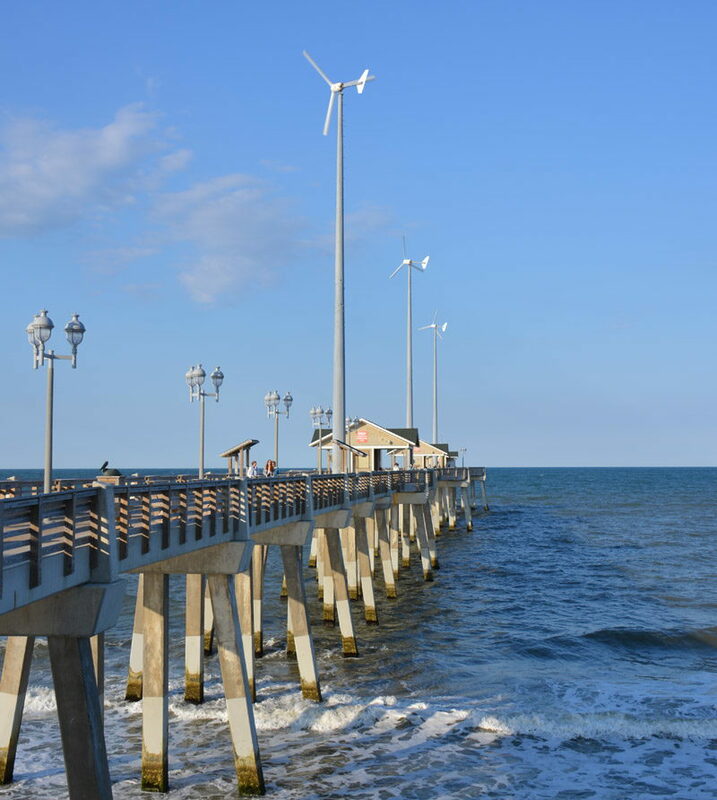 Located in central Kill Devil Hills, the pier offers a snack bar, a gift shop, and even a tackle shop on premise, and is seasonally open 24 hours a day for night fishing. The Nags Head pier was opened in the late 1950s and like its neighbor the Avalon Pier, it offers a tackle shop, gift shop, and snack bar. 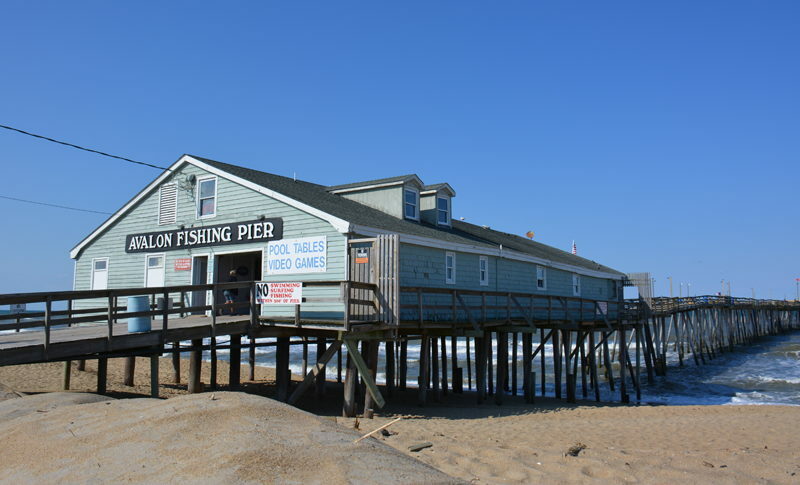 In addition, the Nags head Pier features a restaurant on-premise, so your fishing colleagues can grab a bite to eat in between casts. The pier is pen seasonally, and during summer months, is open 24 hours a day. 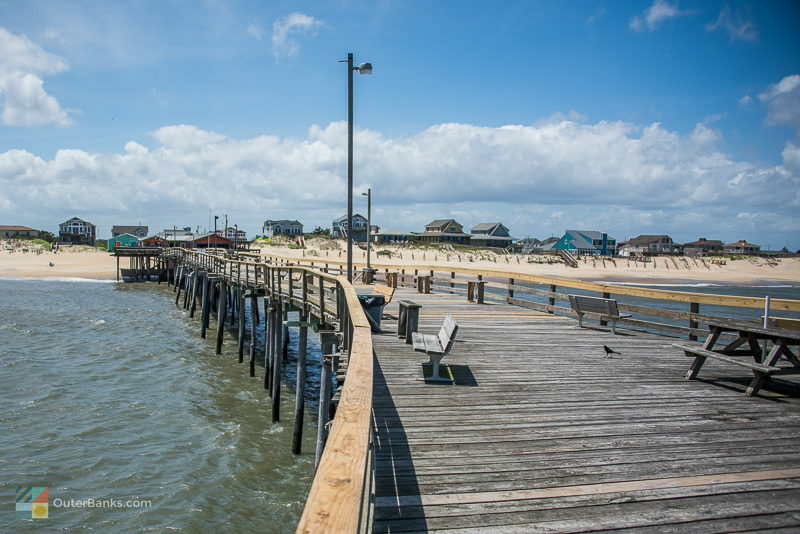 The granddaddy of fishing piers on the Outer Banks, Jennette's Pier originally dates back to 1939 and was one of the first tourist attractions for early anglers. After a complete remodel following years of hurricane damage, the pier is now a partner with the North Carolina Aquarium and features a research center and seasonal exhibits in addition to excellent Outer Banks fishing. Bring the kids along for this one, as there are plenty of educational exhibits and adventures to explore on and off the new wooden pier planks. Quieter South Nags Head also has a slightly smaller though well established fishing pier, the Outer Banks Fishing Pier. 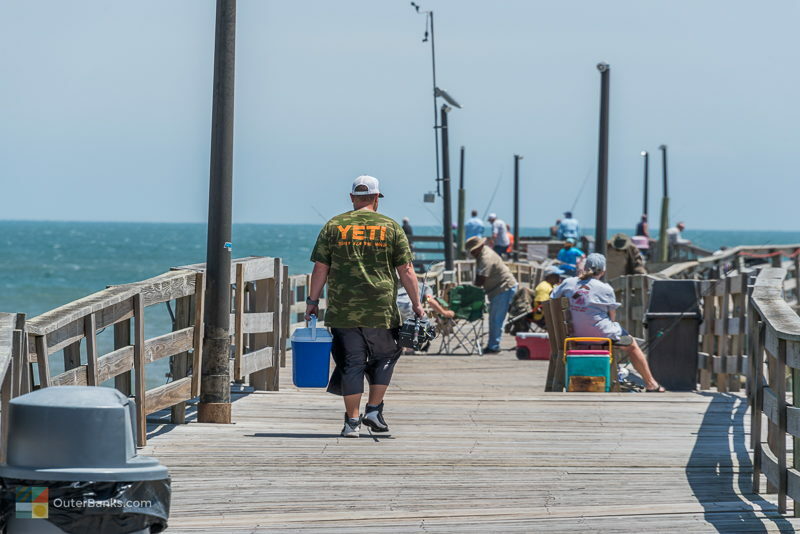 With a tackle shop and small restaurant for a quick breakfast or lunch, the Outer Banks Fishing Pier is also seasonally open 24 hours a day and provides great fishing for those staying in the less populated South Nags Head area. Known informally as the Rodanthe Pier, the Hatteras Island fishing pier has taken a number of hits by hurricanes over the past couple of decades, but has always rebuilt and come back to welcome anglers for the new season. Located in the center of Rodanthe, the pier offers a small tackle shop, a snack bar / game room with pool tables and other entertainment, and some of the best ocean views that the tri-villages have to offer. In the center of Hatteras Island you'll find Avon Pier, which features a tackle shop / snack shop / gift shop for any angling supplies you'll need, from beer to hot dogs to sweatshirts. Open seasonally, the Avon Pier is adjacent to a restaurant and the Spa Koru Oceanfront Beach Club, and is also the launching point for Hatteras Island's annual 4th of July Fireworks display. Fishing licenses are not required, and admission is generally cheap, giving anglers an inexpensive alternative to an in-shore charter trip. Averaging at 700ft long, you'll want to go light on the equipment, or at least find a couple coolers with wheels, as it can be a long trek to the end of the pier and back. Not in the mood to fish? Many piers also let sightseers explore the pier at their leisure for a small $1 or $2 fee. The buck is worth it, as the piers offer a view of the Outer Banks like no other vantage point can. Bear in mind that there is no telling just what you'll reel in off the shore or pier, from dog sharks to black drum, baiting mullet to bluefish, and weather conditions and seasonal temperature changes will inevitably change what fish are biting. Your best bet is to check before you go, either at a local tackle shop or at the pier house, to see what's in season, what's biting, and what's been caught. If you think that you've reeled in a really big sucker, take it to the tackle shop or pier house to be weighed. Exceptionally large fish of certain species may be eligible for a North Carolina Citation, a certificate that is mailed to you a few weeks later, recognizing your big catch. The Outer Banks generally has two seasons of "drum runs:" one in the spring, around April or early May, and one in the fall, usually in September. When the drum hit, it's not unusual to see anglers reeling in fish after fish from the large schools that are skirting past the coastline. Size varies widely, but lucky anglers can reel in a 40-50 lb. drum when the drum run fishing is at its best. Flounder and croaker can be caught during the spring, summer, and fall months, and are both bottom feeders that can be reeled in from the beach or pier. Though not particularly large, these fish are usually meaty enough to provide a good meal. Spanish mackerels make a seasonal appearance from late May to early September and keepers can range from 12" or more. An especially tasty fish, Spanish Mackerels are a common fixture on specials menus at restaurants all along the Outer Banks. Striped bass can also be caught on the Outer Banks, and wintertime anglers have an excellent chance at catching Striped Bass, which are heaviest in numbers in November and December. These larger fish are fun to reel in, and make an excellent seafood dinner. Bluefish or Blues are smaller silver fish that can range from a few short inches to a foot or more. Common off the beach and piers in most any weather, bluefish are one of the most frequently caught fish off the Outer Banks. Sea Mullet, also known as King Mullet, are another species that is commonly reeled in off of piers, or off the beach. Like bluefish, these species are generally small at just a few inches or more, but the smaller varieties make excellent bait fish for larger species. The larger mullets at 1-3 pounds or more are pretty tasty, and can be found during the summer months. Cobia can be caught in the summer months, and at 30 - 60 lbs., can be a challenge to reel in, not just because of their size, but because of the fight these fish have in them. The reward is a nice large and tasty fish, as well as a heck of a good Outer Banks fish story - you'll find most Outer Banks local surf fishing stories begin and end with Cobias. One of the newer crazes to hit the Outer Banks fishing scene is kayak fishing. In fact, several local kayak fishing companies have sprung up in the past few years, offering to take anglers on expeditions to good fishing spots in the sound, the ocean, and even on charter trips to the Gulf Stream to cast from the side of a kayak. Kayak fishing can be a little tricky, and can require some maneuvering to keep the kayak upright and in line while reeling in a big fish. The good thing about the sport, however, is that it allows anglers the opportunity to catch larger species that are generally only accessible by an inshore charter. Charter kayak fishing, one of the more dangerous and thrilling types of kayak fishing trips, entails launching from a charter boat that stays close by to help gaffe and land large fish, like dolphin or Amberjack. Guided fishing tours are recommended for an initial kayak fishing trip, but one you get the hang of it, feel free to take kayak fishing excursions on your own in the sounds, ocean, or basically anywhere you can launch. Whether casting off from the beach, from the back of a charter boat, or off the side of your local pier, fishermen return to the Outer Banks year after year for the outstanding fishing. The sport is responsible for the arrival of the Outer Banks' very first vacationers, and over the years, the popularity of the Outer Banks as a fishing Mecca has only grown. Drive out to the beach with your rods and reels, or head out to the Gulf Stream to tackle a marlin, and discover why fishing on the Outer Banks is considered angling at its best. Is a permit required to fish in the ocean on the Outer Banks? 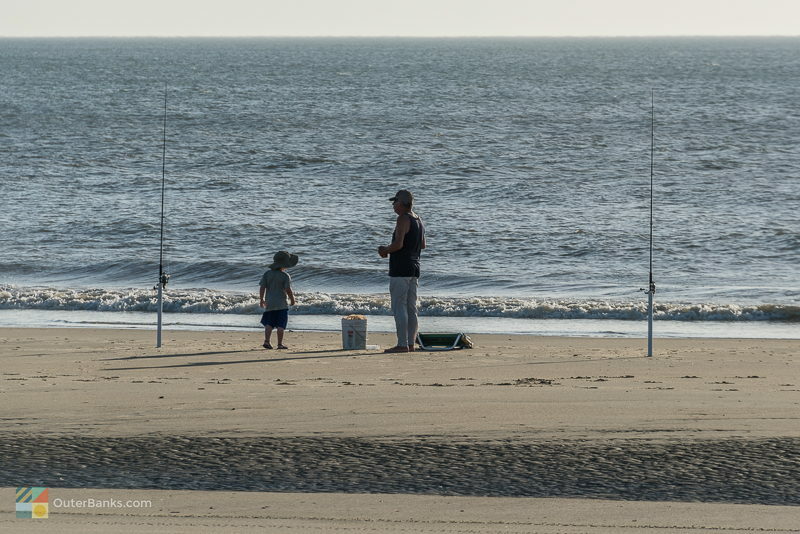 A saltwater fishing permit – formally known as a Coastal Recreational Fishing License – is required to fish along the oceanfront beaches of the Outer Banks. Get yours at the Division of Marine Fisheries website. Is a permit required to fish on the Outer Banks? A Coastal Recreational Fishing License, or saltwater fishing permit, is required to fish in all salt or brackish waters along the Outer Banks. This includes area beaches, sounds, canals and creeks, and harbors. Get yours at the Division of Marine Fisheries website. Where is a fishing permit required on the Outer Banks? A saltwater fishing permit is required for veritably all waters of the Outer Banks, which includes local sounds, (like the Pamlico Sound or Albemarle Sound), local beaches, and harbors or inlets. A permit is generally not required for pier fishing, or for inshore or offshore charters, due to the business’ blanket fishing permit. Where do you get a fishing permit on the Outer Banks? Saltwater fishing permits, or Coastal Recreational Fishing Licenses, can be picked up at virtually all bait and tackle stores along the Outer Banks. A fishing permit can also be obtained online via the North Carolina Wildlife Resources Commission’s website. Division of Marine Fisheries website. How much does it cost to get a fishing permit on the Outer Banks? The cost for a saltwater fishing permit (or license) varies by an angler’s in-state or out-of-state status, as well as the duration of the permit itself. A 10-day license is generally between $5-10 per person, while a lifetime license can range from $100 - $250 or more, depending on the angler’s age. Is a fishing permit required for fishing off of Outer Banks piers? A fishing license (or permit) is traditionally not required for fishing off of the piers along the Outer Banks, as the individual fishing piers are covered by a blanket license for all anglers. What can you catch off the fishing piers on the Outer Banks? There are a number of popular catches that can be reeled in from the Outer Banks piers, which are dependent on the season. Generally speaking, visitors can expect to target red drum in the spring and fall, as well as sea mullet, bluefish, cobia, shark, trout, Spanish mackerel, and other coastal species that are found close to shore throughout the summer and warm weather months. When are the fishing piers open on the Outer Banks? Most of the fishing piers on the Outer Banks are seasonal, and are traditionally open from early spring until late fall. Several fishing piers, like the Jennette’s Fishing Pier in Nags Head, may stay open year round, or for the majority of the year. How late are the fishing piers open on the Outer Banks? During the prime fishing seasons in the late spring, summer, and early fall, many of the Outer Banks fishing piers stay open until late at night for anglers. Several may also operate 24/7 if the fishing is good. Is a fishing permit required for kids on the Outer Banks? 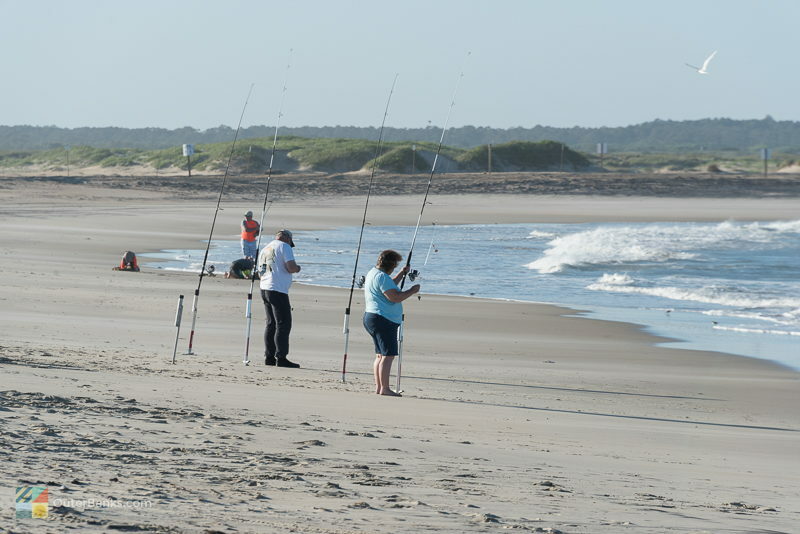 A North Carolina Coastal Recreational Fishing License (or saltwater fishing permit) is only required for anglers who are 16-years-old or older. Can you get a fishing permit for the Outer Banks online? The N.C. Coastal Recreational Fishing License, (or saltwater fishing permit), can be obtained online, and is available via the North Carolina Wildlife Resources Commission’s website at http://www.ncwildlife.org/. 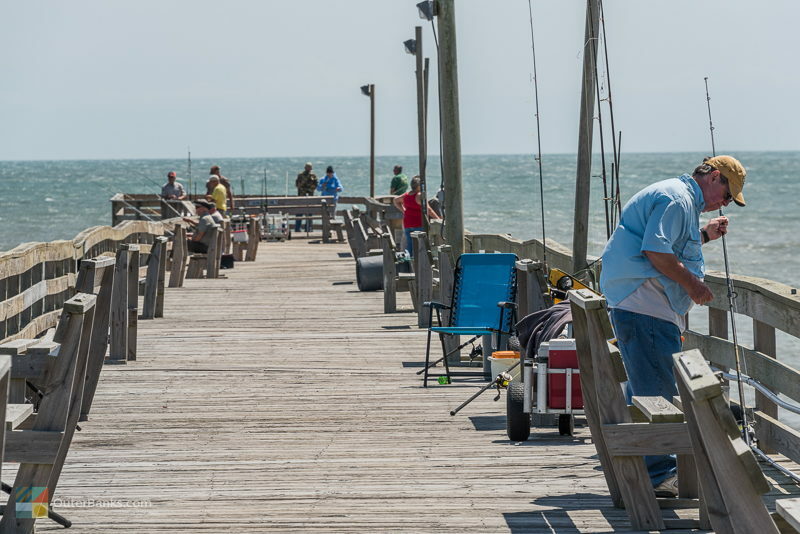 Can you rent fishing equipment at the fishing piers on the Outer Banks? Many fishing piers do offer rods and reels for rent or for sale, as well as other necessities – like tackle, ice and bait – that anglers might need while fishing along the Outer Banks. Does it cost money to fish off the pier on the Outer Banks? 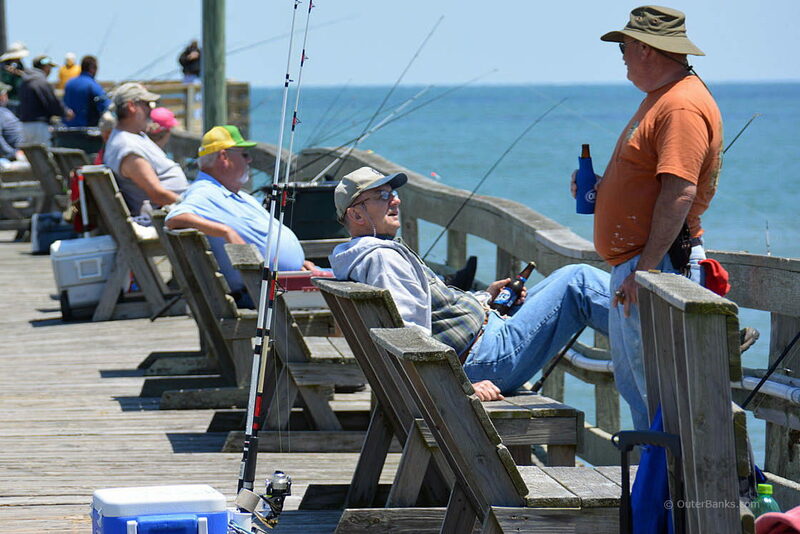 There is a fee to fish off the Outer Banks fishing piers, which varies from pier to pier. Annual, daily, and weekly passes are often available for the convenience of anglers. Is a fishing permit required for offshore charters on the Outer Banks? A saltwater fishing permit, (or Coastal Recreational Fishing License), is traditionally not required for anglers on an offshore fishing charter, as the business’ blanket license can cover everyone on board. Is a fishing permit required for inshore charters on the Outer Banks? Generally, a saltwater fishing permit (or license) is not needed for anglers booking an inshore charter on the Outer Banks, as the business typically has a blanket license which can cover all customers. How do you find out what’s biting on the Outer Banks? Visitors can stop by any Outer Banks bait and tackle store for a brief overview of what local fishermen have been catching. In addition, anglers can also check out several bait and tackle store websites, and can often call fishing piers in their area for a daily or regular fishing report. When is the best time to fish on the Outer Banks? Longtime anglers tend to flock to the Outer Banks in the summer and especially the fall, when a wide array of species can be caught close to shore, such as red drum, king mackerel, striped bass, and speckled trout. What can you catch in the winter on the Outer Banks? In the winter, anglers on the Outer Banks can catch a handful of migrating or cold natured species, including striped bass, bluefish, and red drum. What can you catch in the spring on the Outer Banks? The spring months on the Outer Banks are a popular time for targeting bluefish, cobia, grey trout, red drum, and striped bass. What can you catch in the summer on the Outer Banks? There are dozens of species that can be landed in the summertime from the beaches of the Outer Banks, including bluefish, cobia, croaker, flounder, trout, mackerel, black drum, striped bass, and weakfish. Offshore, anglers can reel in some big and impressive catches as well, such as marlin, Mahi, snapper, and tuna. What can you catch in the fall on the Outer Banks? The fall is prime fishing season on the Outer Banks, and anglers can catch dozens of species along the beaches and close to shore. Popular catches in the fall include red and black drum, croaker, grey trout, bluefish, weakfish, spot, Spanish and king mackerels, and pompano. What is the best time to catch cobia on the Outer Banks? The best time to catch cobia on the Outer Banks is typically from April until June. Anglers should note that there is a quota, as well as a limited season for cobia, all along the East Coast. What is the best time to catch flounder on the Outer Banks? The best time to catch flounder on the Outer Banks is in the warm summer months, or from May until September. Flounder can be found along the beaches, as well as in the local sound waters. What is the best time to catch drum on the Outer Banks? Red drum make seasonal appearances along the Outer Banks in the spring, as well as in the fall months. Black drum are more common in slightly warmer weather, generally from April through September. What is the best time to catch marlin on the Outer Banks? Blue and white marlin are typically found in the summer months via offshore charters that launch from the Outer Banks, and which target the Gulf Stream. What is the best time to catch Mahi (or dolphin) on the Outer Banks? Mahi are found throughout the summer and fall months in the offshore waters that border the Outer Banks. If water temperatures are warm enough in the summer, Mahi can also make rare appearances at local Outer Banks fishing piers. What is the best time to catch tuna on the Outer Banks? Yellowfin and Bluefin tuna are popular fall and spring catches for offshore anglers, and they tend to be abundant from March until May, and from October to December. What is the best time to catch trout on the Outer Banks? Grey trout and sea trout are both common catches in the warmer summer month along the Outer Banks, which is generally from April until September or October. What is the best time to catch Spanish and King Mackerel on the Outer Banks? Spanish and king mackerels tend to be found along the Outer Banks coastline in the summer, from roughly May until September. What is the best time to catch Bluefish on the Outer Banks? Bluefish is an unusual species along the Outer Banks, as it’s possible to catch this species all year long. With that being said, anglers have the best chance of reeling in bluefish from March until June, and from September until December. What is the best time to go crabbing on the Outer Banks? Anglers who want to try their hand at crabbing will have good luck in the spring, summer, and fall months, when it’s warm enough to wade and look for the tasty blue crabs that are found in both the ocean waters, as well as the local sounds. Where are the major charter centers on the Outer Banks? 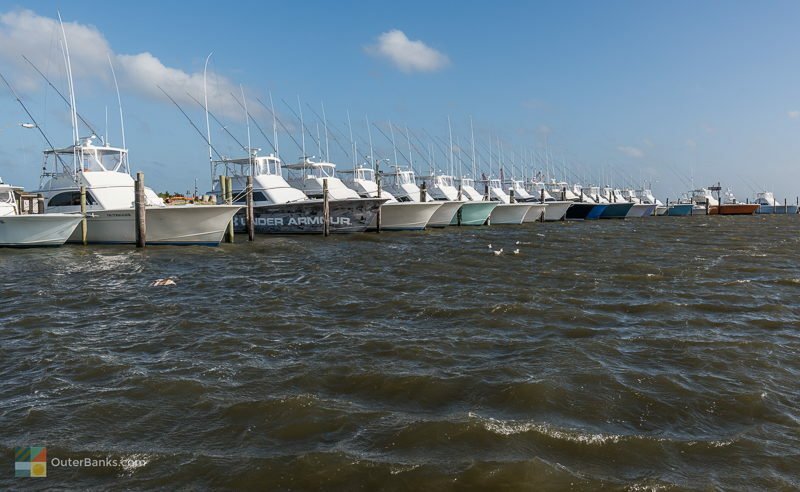 The major charter centers on the Outer Banks are the Oregon Inlet Fishing Center next to the Bonner Bridge, as well as the Hatteras village docks, which are home to roughly a half dozen marinas. There is also a popular charter fishing hub located in the barely inland town of Wanchese on Roanoke Island. What gear is needed for surf fishing on the Outer Banks? Anglers will want a surf rod to tackle the beaches of the Outer Banks, especially in the spring and fall when high winds can produce rough surf. Live and artificial bait will work, as well as an array of different rigs. Anglers will want to head to a local tackle shop for more guidance on additional equipment, as well as the best rod and reel combos for the local fishing conditions. What are the largest fishing tournaments on the Outer Banks? Where can I launch my boat on the on the Outer Banks? There are a number of both public and private boat ramps found throughout the Outer Banks. Popular launch sites include the Dare County Public Boat Ramp in Kitty Hawk, (along Bob Perry Road), the Oregon Inlet Fishing Center next to the Bonner Bridge, the various marinas along the Hatteras village waterfront, and the National Park Service public boat ramp on Ocracoke Island. Can you fish off of Hatteras Inlet? Anglers can fish along Hatteras Inlet, but may want to obtain a beach driving permit from the National Park Service, as the inlet is roughly 2.5 miles from the closest paved parking area. Anglers should also note that the beaches bordering the inlet may be seasonally restricted or closed due to bird and sea turtle nesting seasons. Can you fish off of Ocracoke Inlet? Anglers can fish off of Ocracoke Inlet, and an ORV (off road vehicle) ramp that leads to the inlet is found just north of Ocracoke village. A beach driving permit from the National Park Service is required to drive along the beaches, and the shoreline surrounding the inlet may be seasonally closed to vehicles and / or pedestrians for endangered or threatened bird and sea turtle nesting. Can you fish off of Oregon Inlet? Anglers can fish in the waters of Oregon Inlet via several methods. A parking area is located at the southern terminus of the Bonner Bridge for folks who want to park and wade out, and the northern beaches that border the inlet are seasonally open to pedestrians and / or 4WD vehicles that have a National Park Service-issued beach driving permit. In addition, anglers can walk along the southern end of the Bonner Bridge to fish directly from the bridge itself. Can you fish off the Bonner Bridge? Anglers can fish off the Bonner Bridge, courtesy of a catwalk which is located on the southern end of the bridge’s entrance. When the new Bonner Bridge is completed in late 2018, a section of the old Bonner Bridge will remain standing and open to pedestrians for fishing as well. Can you fish off the bridges on the Outer Banks? There are a number of bridges that have catwalks or pathways where anglers can fish along the Outer Banks. The most popular bridges for fishing are the Bonner Bridge, which stretches across Oregon Inlet, and the “Little Bridge,” which is found along the 64 / 264 Causeway that links Nags Head with the town of Manteo and Roanoke Island. Is there any freshwater fishing on the Outer Banks? Freshwater fishing can be scarce along the Outer Banks, but it is available. Anglers will have the best luck at freshwater fishing by exploring the small inland ponds in area nature preserves, like Buxton Woods and Kitty Hawk Woods. There are also several small freshwater ponds in larger communities throughout the Outer Banks as well, such as in the soundside Kinnakeet Shores subdivision on Hatteras Island. 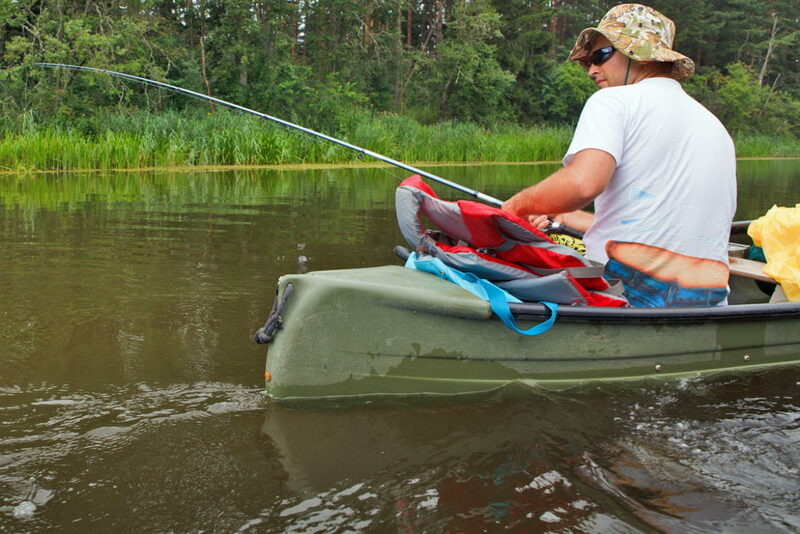 Where can you go kayak fishing on the Outer Banks? Anglers can go kayak fishing just about anywhere along the Outer Banks, and particularly in the local sounds where the waters are shallow, calm, and generally easy to navigate. Multiple launching spots are available throughout the islands, and anglers can also simply launch from a soundside beach as well to access the water. Popular kayak launching beaches along the sound include Jockey’s Ridge State Park in Nags Head, the Salvo Day Use Area on Hatteras Island, and the Canadian Hole parking area, also located on Hatteras Island. Use caution near inlets, as currents can be deceptively swift. Where can you buy bait on the Outer Banks? There are dozens of bait and tackle stores throughout the Outer Banks where anglers can pick up both live and artificial bait, lures, fishing lines, and virtually all supplies they will need to go fishing. In addition, many of the Outer Banks’ grocery stores and even convenience stores also sell fishing supplies, including bait. Where can you buy fishing supplies on the Outer Banks? Anglers will find dozens of bait and tackle stores on the Outer Banks, which are stocked with fishing supplies that are designed for the local coastal waters. In addition, general fishing equipment can also be found at area convenience stores, grocery stores, and beach shops throughout the Outer Banks. Where can you get a rod or reel repaired on the Outer Banks? Many bait and tackle stores offer rod and reel repair services for anglers who need assistance on the Outer Banks. Do I need a surf fishing rod to fish on the Outer Banks? It is recommended to use a surf rod for fishing along the Outer Banks beaches, as the winds, waves and currents can be tough on smaller and less substantial rods. In the sounds, creeks, and calmer waters, virtually any rod will work. Can you fish off the Point? Cape Point on Hatteras Island is deemed one of the best surf fishing spots on the Outer Banks, as well as the East Coast, due to its physical location that jets out into the ocean. Cape Point is usually open to ORVs and pedestrians, however, there may be seasonal closures in the summer and early fall due to endangered or threatened bird and sea turtle nesting. Can you fish in the sounds of the Outer Banks? The local sounds of the Outer Banks, (such as the Pamlico Sound, Roanoke Sound and Albemarle Sound), can be surprisingly solid fishing grounds for a wide array of species, including sheepshead, flounder, mullet, and smaller bait fish. Both surf fishing and cast netting can yield good results when fishing in the Outer Banks’ sounds. What are the best spots for surf fishing on the Outer Banks? One of the best spots for surf fishing on the Outer Banks is Cape Point on Hatteras Island. This beach juts out into the Atlantic Ocean, and attracts a myriad of large species throughout the year. Additional popular surf fishing spots include shorelines that border the local inlets, (namely Hatteras, Ocracoke and Oregon Inlets), as well as beaches that are close to area fishing piers, like Jennette’s Pier in Nags Head. What can you catch in the ocean on the Outer Banks? Depending on the season, there are dozens of different species that can be reeled in from the ocean waters of the Outer Banks. Popular seasonal species include red and black drum, spot, croaker, sea and grey trout, sea mullet, bluefish, and sharks. What can you catch in the sounds of the Outer Banks? A wide array of saltwater species can be caught in area sounds, including bluefish, sheepshead, flounder, spot, croaker, and striped bass. Anglers will have good luck casing close to submerged structures – like bridge pilings or duck blinds – and a kayak or small boat may come in handy to cover more ground. Can you rent a fishing boat on the Outer Banks? There are several local businesses throughout the Outer Banks, and especially on Ocracoke Island, that offer hourly or even daily boat rentals for anglers who want to explore the open waters. How much is an Outer Banks fishing charter? The cost for a fishing charter on the Outer Banks varies based on the length of time, as well as the type of charter trip. Inshore charters are generally less expensive, and frequent the waters and inlets close to shore. Offshore charters that head out to the Gulf Stream are more expensive, and can typically accommodate six people or so per trip. How far do offshore charters go on the Outer Banks? Depending on where the charter launches, an offshore charter typically heads to the warm waters of the Gulf Stream, which is approximately 12-20 miles away from the coastlines of the Outer Banks. Hatteras village and Ocracoke Island are generally the launching points that are the closest to the Gulf Stream waters. How close is the Gulf Stream to the Outer Banks? The Gulf Stream is approximately 12-20 miles away from the beaches of the Outer Banks, depending on the exact location. Hatteras Inlet, Oregon Inlet and Ocracoke Inlet are traditionally the three closest launching points to the Gulf Stream. How far do inshore charters go on the Outer Banks? Inshore charters generally stay within 5-10 miles of the Outer Banks coastline, and frequent the inlets, sounds, and open ocean waters where a myriad of species may be biting. Where do fishing charters launch on the Outer Banks? Most fishing charters launch from area marinas and / or fishing centers, including the Oregon Inlet Fishing Center, the docks in the town of Wanchese on Roanoke Island, and the docks of Hatteras and Ocracoke villages. What is the difference between Inshore and Offshore fishing charters on the Outer Banks? Inshore fishing charters frequent the waters close to shore along the Outer Banks, including area sounds, inlets, and the open waters of the ocean. Offshore fishing charters head out to the Gulf Stream and ocean waters that are miles away from the local Outer Banks shoreline. Do you have to tip on an Outer Banks fishing charter? It is customary to tip the First Mate (or captain) of a fishing charter at least 15-20% on the Outer Banks. What supplies should you bring on an Outer Banks fishing charter? The fishing charter will supply all fishing supplies that an angler needs, including rods and reels, lures, line, tackle, and grappling hooks as needed. Fishermen should bring along coolers with food and drink, sunscreen, and any other personal items unrelated to fishing gear. Will you get seasick on an Outer Banks fishing charter? If the waters are choppy, and wind speeds are a sustained 10 mph or more, you may get a little seasick on an Outer Banks fishing charter, especially while en route to or from the Gulf Stream. Bring along a little Dramamine just in case. Are any beaches closed to fishing on the Outer Banks? Some beaches within the Cape Hatteras National Seashore on Hatteras and Ocracoke islands have seasonal closures for bird and sea turtle nesting. These closures are posted at multiple online locales, including the Cape Hatteras National Seashore’s website and social media pages. What and when is the Hatteras Village Offshore Open? The Hatteras Village Offshore Open is an offshore tournament that takes place in mid to late May, and which launches from the heart of Hatteras village on the southern Outer Banks. The Hatteras Village Offshore Open has been going strong for roughly 25 years. What and when is the Alice Kelly Ladies Billfish Tournament? The Alice Kelly Ladies Billfish Tournament is a grand offshore tournament that is only open to women anglers. The tournament is typically held in the middle of August, and launches from the Pirates Cove Marina on the Nags Head / Manteo Causeway. What and when is the CAHA Tournament? The CAHA Tournament – or Cape Hatteras Anglers Club Tournament – is a surf fishing tournament that invites 120 teams from all across the country for exceptional fall fishing on the Outer Banks. The Cape Hatteras Anglers Club Tournament is one of the oldest tournaments in North Carolina, and has been going strong for more than 60 years. What and when are the red drum tournaments? There are a number of red drum tournaments that are hosted by fishing organizations and groups, as well as local bait and tackle stores or businesses. Red drum tournaments are generally held in the fall, (or the spring), when the migrating drum runs show up on the area beaches in full force. What are the largest catches on the beaches of Outer Banks? What are the most popular catches on the Outer Banks? Red drum are one of the most popular catches when the weather cools off in the fall, however other popular (and tasty) local catches include cobia, Spanish mackerel, king mackerel, striped bass, bluefish, flounder, spot and croaker. Will restaurants cook and prepare my Outer Banks catch? Several restaurants throughout the shoreline may clean and prepare your Outer Banks catch, and particularly restaurants that have adjacent or sister fish markets. Be sure and ask in advance if this service is available. Will fish markets cook and prepare my Outer Banks catch? Area fish markets may help clean and prepare your Outer Banks catch, depending on the individual business. Call ahead to see if your local Outer Banks fish market supplies this service. Where can I get my Outer Banks catch cleaned? Local fish markets may offer cleaning services for fish caught along the Outer Banks, and bait and tackle stores can also provide guidance on how to clean your catch, and / or who to contact. Can you drive on the beach to go fishing on the Outer Banks? 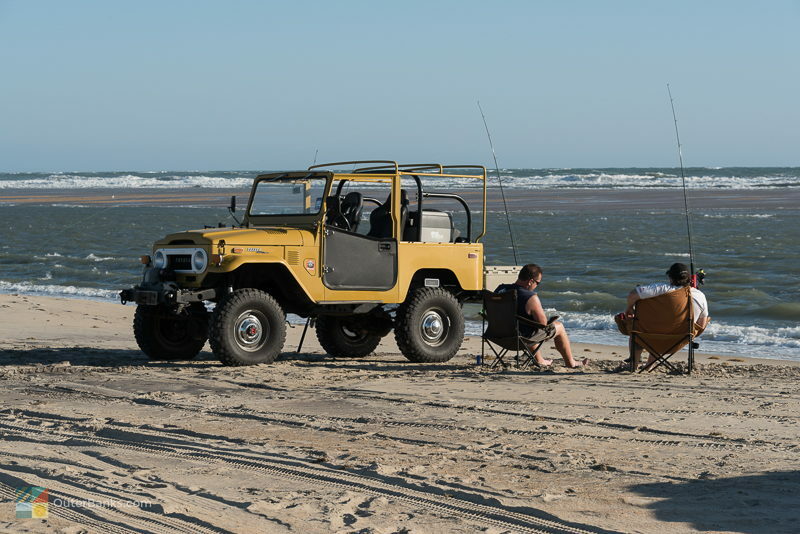 A number of beaches are seasonally open for 4WD vehicles, which includes the Currituck beaches just north of Corolla, as well as many beaches within the Cape Hatteras National Seashore on Hatteras and Ocracoke Islands. A 4WD and licensed vehicle is required, as well as a beach driving permit from the National Park Service for Hatteras and Ocracoke islands. Where can you drive on the beach to fish on the Outer Banks? Visitors can head to the Outer Banks’ northernmost beaches just north of Corolla, as well as the southernmost beaches on Hatteras and Ocracoke Islands to find miles of shoreline that is open for beach driving. A registered, licensed 4WD vehicle is required, and a beach driving permit will need to be obtained as well for the southern Outer Banks shorelines. What happens if you fish without a license on the Outer Banks? Anglers who fish without a license on the Outer Banks are often charged a fine that varies based on the species and the exact violation. Can you fish at night on the Outer Banks? All of the beaches on the Outer Banks are open at night for anglers. Visitors should note that from May through September, most all of the beaches within the Cape Hatteras National Seashore may be closed to 4WD vehicles at night, (but not pedestrians), due to sea turtle nesting. Where can you see the charter boats’ catches on the Outer Banks? Visitors who want to see what the local charters have landed can head to the boat docks of Hatteras village or the Oregon Inlet Fishing Center to see the day’s catches hauled in and weighed. 4:00 p.m. is generally a good time to catch the show, and ample parking is available at both locales. How crowded are popular fishing spots on the Outer Banks? When the fishing is good, some of the most popular spots for surf fishing on the Outer Banks, (like Cape Point in Buxton), can be elbow-to-elbow with anglers and 4WD vehicles. With that being said, there are miles of shoreline to go around, and it is not difficult to find an unpopulated spot somewhere along the beach – even in the height of summer. Use courtesy and caution when casting if the area beaches are crowded. Are there fishing guide services on the Outer Banks? There are several fishing guide services on the Outer Banks, (and particularly on Hatteras and Ocracoke Islands), that offer a wide array of small trips at local fishing holes – such as kayak fishing trips, or small boat trips. Can you rent a kayak to fish on the Outer Banks? Kayak rentals are available from a number of outdoor provision companies, watersports companies, and generalized beach supply rental companies. Kayaks can often be rented on an hourly, daily, or even weekly basis, and when rented from a beach rental supply company, can even be delivered to an area vacation rental home. Can you rent fishing equipment on the Outer Banks? Many local piers may offer fishing equipment to rent for visiting anglers. In addition, several beach rental supply companies may offer fishing gear on a daily or weekly basis as well, including rods and reels, kayaks, beach chairs or canopies, rod holders, and other required supplies. The Wright Brothers National Memorial is a "Must See" attraction for any Outer Banks aviation enthusiast, history lover, and virtually any Kill Devil Hills vacationer who wants an up-close look at the towering granite structure that towers over the town's landscape.